As a manager it is important and often a requirement to prepare activity reports, but doing so can be cumbersome. To subordinates this chore can take away from the very productivity that they are reporting on. For the person responsible for collecting the data, dealing with cutting and pasting and formatting issues is a continuous hassle. The highest compliment that we consistently get is that Bravo is so easy to use. Let’s face it, no one really likes doing activity reports, it has to be simple or people will not use it, and if that happens then the open communication within an organization is at risk of being stifled. Although simple on the surface, there really is a lot going on behind the scenes. Making entries could not be easier. Users simply enter text in Activity Reports tab to add an entry. Once saved, the entry becomes a single bulleted item on a report. Then at the end of the reporting period, the administrator publishes the entries with a single click whereby making them instantly available in a variety of report formats. Have you ever been in a meeting and someone says, "Hey, that is important, we need to do that. ", and then when the meeting is over it is not clear who is going to make sure the important task gets completed? 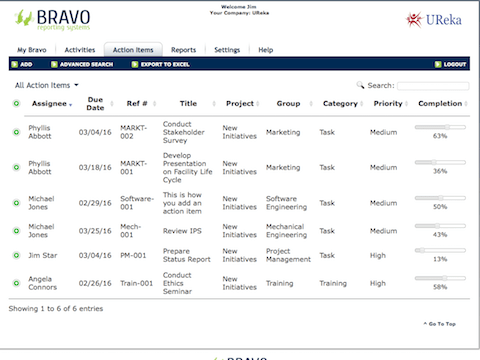 With Bravo's Action Item Tracker, it is very easy to make and assign an entry to the appropriate resource. 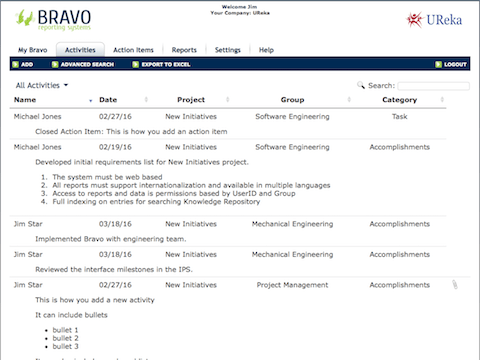 When an action item is closed it automatically shows up as a completed task on the weekly activity report.